Just thought I’d show off this morning’s trip to Festival Foods during their anniversary sale. There’s a great Quaker promotion where you get $5.00 off when you buy five select items. Milk and sour cream were cheap, too, with store coupons. I even scored several packages of manager’s specials in the meat department for more than 30% off the regular price. I saved about 35% off the total bill and only used the store’s coupons, no manufacturer coupons needed! Thirty-five percent may not seem like a lot, but for our family, that’s pretty good because of what we don’t buy anymore, plus the great deals on meat that didn’t involve wading through the massive crowd during a One Day Meat Sale. To get a closer look at the anniversary sale specials at Festival Foods, head over to Heather’s Hollander Hut. 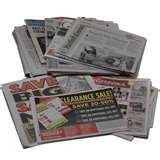 There are several sites in the region doing sales and coupon match-ups for most of our area stores. Here’s a closer look at some of our favorite blogs and all their hard work! Festival Foods is having a Two Day Meat Sale on Wednesday, October 2 and Thursday, October 3. Save up to 50% on family pack items. For the rest of this week’s Festival deals, head over to Heather’s Hollander Hut.